This Phil and Sebastian review and testing has been a long time coming, and I do apologize. Delays by Canada post as well as other personal things have pushed this back a little. Nevertheless, here is part one: the Brazil coffees. I received two separate bags of Fazenda do Serrado, Brazil. One was profiled for espresso, and the other was roasted for pour over/ drip/ etc. Even though I usually only focus on espresso testing, I was very interested to play with these coffees on multiple brewing methods. Brewed with 19grams of coffee via a Brewt device. Initial results were delicious, with a juice-like mouth-feel and taste. Notes included: dark cherry, stone fruit, chocolate and grape. Nice round body and mouth-feel, syrupy and medium acidity. Brewed with 50grams of coffee via Bodum. Clearly the biggest difference was the change of body, which was much thicker brewed in the press pot. Also picked up on some nutty components, faint fruit and a citrus-like acidity. Brewed with 18 grams of coffee with the upside-down method aeropress and coava disc. The body was similar to the pour over, but it had similar nutty notes of the press pot with stone fruit components. 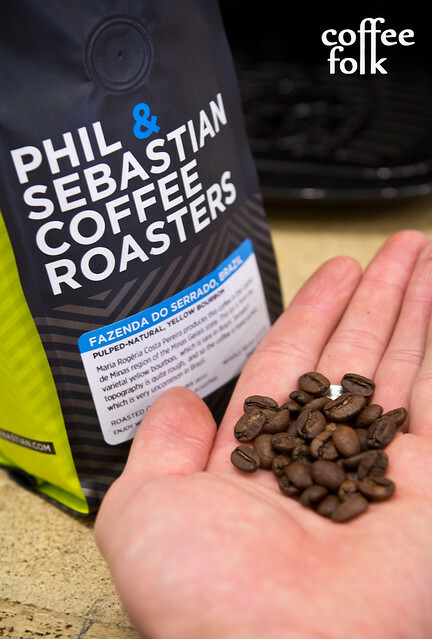 The overall cup was well balanced, great acidity, displaying typical Brazil qualities with surprisingly delicious stone fruit and nutty aspects. I’d be happy to drink this one day in and day out. 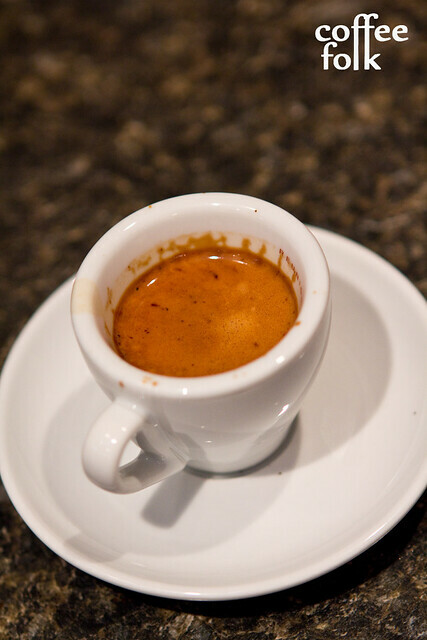 Starting from the usual baseline with this espresso (94 degrees Celsius, 19grams) I made some guess work on the grind. I was finding different, but great results at 93 – 94 degrees Celsius. The dose seemed to work best at 19.0 grams, with a final liquid weight of ~29-31 grams and total shot length of 25-27 seconds was ideal. Keep reading for details. Fazenda do Serrado, Brazil: "naked"
This was pulling an acceptable shot between 93 and 94 degrees Celsius, with best results (in my personal opinion) @ 93 degrees Celsius: nice sweetness, vanilla, peach, stone fruit, hints of tobacco and a syrupy overall taste and mouth-feel. @ 94 degrees Celsius: there was also vanilla, peach, apricot, but there was a definite brighter citrus-like acidity. The syrupy play turned to a brighter honey-like play. This was a delicious espresso, and I’d be happy to receive either of these incarnations at a coffee shop. Pulling 19.2 grams solid to 30.7 grams liquid and adding 115 grams of milk (~6oz total volume cappuccino) it was evident the stone fruit qualities disappeared. Instead it turned into a nice sweet toffee and milk chocolate cappuccino, even caramel-like at times. The americano was decent. Personally I found the body diminished and the very special juice-like qualities I enjoyed so much in the coffee also subsided. 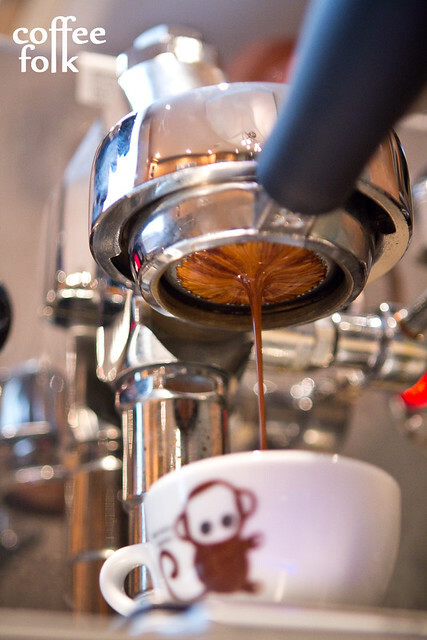 Another surprising single origin espresso that was multidimensional. Nice complexity, and I was blown away by the changing flavour profile as the temperature changed. Good tobacco notes at 93 Celsius, which is a rarity. Final score for this coffee… 92/ 100. One of the best Brazil coffees I have had in a long time!